The 1914 New York state election was held on November 3, 1914, to elect the Governor, the Lieutenant Governor, the Secretary of State, the State Comptroller, the Attorney General, the State Treasurer, the State Engineer, a U.S. Senator and a judge of the New York Court of Appeals, as well as all members of the New York State Assembly and the New York State Senate, and delegates-at-large to the New York State Constitutional Convention of 1915. This was the first time that U.S. Senators from New York were elected by general ballot. Until 1911, the U.S. Senators had been elected by the New York State Legislature, but the lengthy stalemate between Tammany and a faction led by State Senator Franklin D. Roosevelt, who was decided to impede the election of William F. Sheehan or any other crony of Tammany boss Charles F. Murphy, led to a constitutional amendment. Since 1914, the U.S. Senators have been elected with the state officers on the state ticket, and selected in the party primaries. The Socialist state convention met on July 5 at Rochester, New York. They nominated Charles Edward Russell for U.S. Senator; Gustave Adolph Strebel for governor; Stephen J. Mahoney, of Buffalo, for lieutenant governor; Mrs. Florence C. Kitchelt, of Rochester, for secretary of state; Charles W. Noonan, of Schenectady, for comptroller; James C. Sheehan, of Albany, for treasurer; Frederick O. Haller, of Buffalo, for attorney general; Prof. Vladimir Karapetoff, of Cornell University, for state engineer; and Louis B. Boudin for the Court of Appeals. The Prohibition State Committee met on August 15 at Syracuse, New York, and voted to nominate Ex-Governor William Sulzer for governor instead of the previously selected Charles E. Welch, who then ran for lieutenant governor. The Socialist Labor ticket was filed with the Secretary of State on October 9, 1914. They nominated a full ticket. Ex-Governor Sulzer's aim was to defeat Glynn whom he considered a back-stabber. For this purpose he organized the American Party, and accepted the nomination by the Prohibition Party. He also sought the nomination of the Progressive Party, but was defeated in their primary. The American Party Executive Committee also endorsed a full slate (Prohibitionists Welch and Clements; Progressives Call and Colby; Democrat Seabury; Charles Horowitz for comptroller; Charles Podsenick for attorney general; and Robert Butler for State Engineer) for the other offices, but did not file a petition to nominate them, so they did not appear on the ballot in the American column. The Republican, Democratic, Independence League, Progressive, Socialist and Prohibition parties maintained automatic ballot access (necessary 10,000 votes for governor), the American Party attained it, and the Socialist Labor Party did not re-attain it. 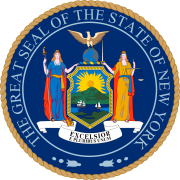 34 Republicans and 17 Democrats were elected to a two-year term (1915–16) in the New York State Senate. 100 Republicans, 49 Democrats and one Progressive were elected for the session of 1915 to the New York State Assembly. Glynn also polled 3,764 votes; and Sulzer 1,426; in the "no-party column," a blank space provided for write-in candidates. ^ The Progressive member was Hamilton Fish III who had run also on the Democratic ticket in his district.